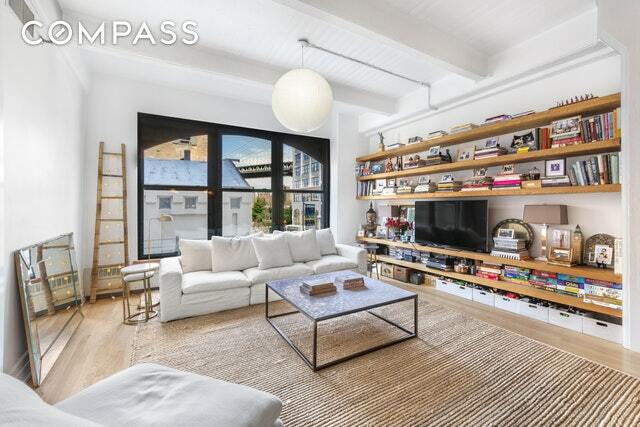 Embrace quintessential Dumbo loft living in this bright and airy two bedroom, one and a half bathroom featuring picture postcard views, sprawling living space and generous storage. Embrace quintessential Dumbo loft living in this bright and airy two-bedroom, one-and-a-half-bathroom featuring picture-postcard views, sprawling living space and generous storage. Positioned in the building's highly desirable A line, this 1,515-square-foot home is flooded with glorious light and breathtaking views of the Manhattan Bridge, East River and Brooklyn Bridge Park — all framed by iconic arched windows. Soaring beamed ceilings and hardwood floors invite you into the oversized great room where you'll find plenty of room for luxurious living and dining areas alongside stylish built-in shelving. Bold pendant lighting sets a dramatic tone in the open chef's kitchen where a long breakfast bar provides additional space for casual dining and conversation while a full complement of stainless steel appliances awaits your culinary skill. Wake up to gorgeous northern light and rooftop views in the spacious bedroom, where three large closets — including a custom walk-in — lead the way to the luxurious en suite bathroom filled with a soaking tub, separate shower, a marble double vanity and stunning marble basket weave tile. The second well-appointed powder room is accessible to both the living room and the spacious home office, which can easily serve a nursery or guest suite. A large entry closet and oversized laundry room with in-unit washer-dryer add to this home's total convenience. This unit is pre-wired with CAT-5, cable and phone lines, and business-class internet service is available for only $10/month. Located within the DUMBO Historic District, the Sweeney Building is a 1908 Neo-Classical Industrial style stunner built by the W.H. Sweeney Manufacturing Corp. — makers of metal kitchenware. Residents of this gorgeous converted condominium enjoy full-time doorman service, a renovated fitness center, furnished roof deck, storage cages and bike room. Located just one short block from Brooklyn Bridge Park, this home offers a front-row seat to spectacular waterfront open space, jaw-dropping views and unlimited recreation. The fantastic Empire Stores and St. Ann's Warehouse deliver fantastic shopping and entertainment, while the local dining scene features great spots for seafood, French and Italian cuisine. A/C, F, 2/3, R and 4/5 trains, plus the Fulton Ferry Landing, provide effortless access to the rest of the city.